“First of all, there is the subtle yet vital conducting of Kempe. He knows better than most other RING conductors how to balance blazing passion with mystery; next to him, Solti sounds vulgar and blatant. Anyone who is familiar with Kempe's MEISTERSINGER will know what I mean. Kempe has the gift of making this music sing and surge heroically, without ever sounding overblown or pompous, something that Solti seems not to be able to avoid. 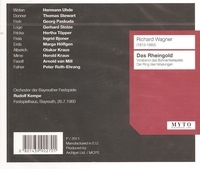 Part of this is the recessed Bayreuth orchestra sound, which allows a perfect balance between singer and orchestra. This set offers a superb demonstration of the unique Bayreuth acoustic. Uhde's Wotan is strong and incisive, perhaps smaller in voice than Hotter, but steady of tone and more scheming in character than usual; this Wotan is clearly no saint! This is a treasurable RING, and I would recommend it to anyone. Not being terribly fond of any of the stereo RINGS, this Kempe RING would be my first choice, along with Knappertsbusch's 1956 Bayreuth set."